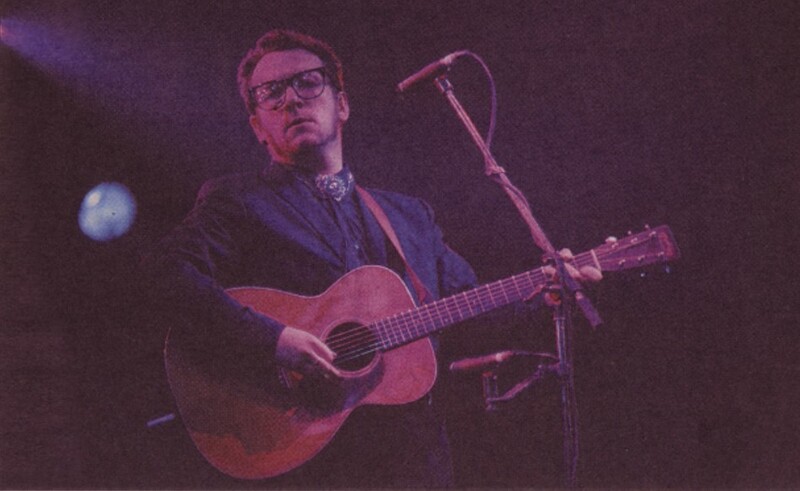 Next week, all of the Wizards are off to see Elvis Costello and The Imposters in Liverpool. I have genuinely lost count of exactly how many times I have seen Elvis live over the years, it’s some number in the 20s. Here are a few of my memories of The Ghosts of Elvises Past. 5th February 1989: Tower Records, Picadilly Circus, London. This was the night that the Spike album was released and it wasn’t really a gig as such. Tower Records was opening up at midnight to sell the new record and Elvis was going to be there to sign copies. 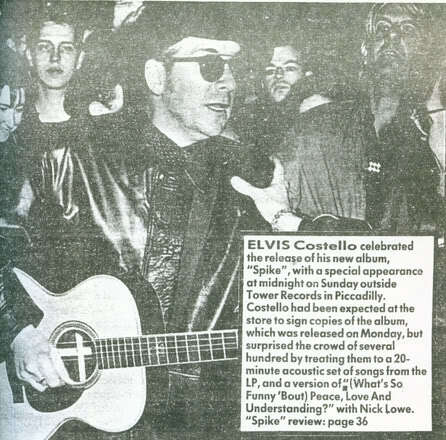 I travelled up there with my boss Andy and his wife Kath who were even more nuts about Costello than I was. It was a cold Sunday night and we were waiting outside for a few hours. Then came Elvis and Nick Lowe, suddenly appearing from Regent Street armed with acoustic guitars. They stood in front of the shop and played 4 or 5 songs. I think “Pads Paws and Claws” was one of them and they definitely sang “(What’s So Funny ‘Bout) Peace Love and Understanding”. After that, we all queued politely (apart from a window getting smashed) to get our copies of the album. We had plenty of time to work out something cool to say to Elvis when we finally got to speak to him but I don’t remember what I said at all. I’ve still got my signed copy of Spike on the format that nobody gets nostalgic for, the cassette. 2nd June 1989: Royal Albert Hall, London. A few days before this gig I came down with chicken pox and I quickly realised why people try to expose their kids to it while they’re young! Every single place on my body itched at the same time and I just didn’t have enough hands to do all the scratching. My mum was dead set against me going to the gig and still mentions it from time to time. But I had The Smiths in my mind. A couple of years earlier, I’d sold my mate the ticket I had for The Smiths gig at Kilburn National Ballroom with the “it’s alright, I’ll go and see them on the next tour.” (more on this subject here, on podcast 6 and podcast 8) Of course, there was no next tour for The Smiths and this was still fresh pain to me in 1989. I was deeply concerned that if I stayed at home in my ocean of Calamine lotion then some terrible fate would befall Elvis and I would never get to see him in concert! So I went and sat up on the balcony, fidgeting, scratching and thoroughly annoying those in the seats around me. But the gig was worth the discomfort. That man Nick Lowe supporting followed by 2 hours plus of solo Elvis with guitar. Lots of Spike tunes of course and I remember he sang “You Want Her Too” which he’d co-written with Paul McCartney for the “Flowers in the Dirt” album. 17th June 1989: Glastonbury Festival. The previous summer, I’d been to my first ever festival: the Amnesty International Festival of Youth at the Milton Keynes Bowl. The music was great (The Damned, Big Audio Dynamite, Joe Strummer and The Latino Rockabilly War) But offstage, some of the goings on made me wonder if I was cut out for this whole festival malarkey. In the bowl itself, there were the constant bottles of piss flying overhead and every couple of hours a mass punchup in the crowd. I didn’t bother taking a tent so I just slept in my mate’s car, only to be awoken the next morning by the car parked next to us being set on fire by some hairy bikers who really couldn’t have looked any more stereotypical if they’d tried. All of this was a bit much for a timid 17 year old Chorizo. But I soon forgot all of that when I saw who was playing at Glastonbury in 1989. Pixies! Waterboys! Costello! Count me in, here’s my 28 quid for the ticket. The vibe of Glastonbury was altogether different from the beery yobbish festival I’d been to the summer before and the sun shone on Avalon for the whole weekend. We’d all heard the stories about the festival toilets, including the one (urban myth?) about the bog that got pushed over with someone in it and landed door downwards. With this in mind, my mate Rich said he wasn’t going to have a crap for the whole weekend but apart from that, the weekend was a joy. All 3 of the bands I’d come to see delivered storming sets and we were right down the front with our elbows on the crash barriers for each of them. Incidentally, on the Sunday afternoon, Van Morrison was on and him and his band were fantastic. They ended their set with a particularly peculiar song called Max Wall. This song was just a list old 50s / 60s comedians (Tommy Cooper, Spike Milligan etc) and the chorus just went “Max Wall Max Wall Max Wall” whilst notoriously grumpy Van did the funny walk! I’ve told many people about this over the years and nobody ever believes me. They just look askance at me and put it down to my fevered imagination being fuelled by sunshine and other intoxicants. But recently I found this on Youtube so you see I didn’t just imagine it, it really happened! Even more amazingly, Rich completed his mission too. From our arrival on Thursday night to leaving on the Sunday night, not one stool exited his body. Because of him, somewhere there is a retired cleaner from a Little Chef on the A303 who is still having the nightmares about that Sunday night! My ticket. £16.50 was a lot for a gig in those days! This was on the “Come Back in a Million Years” tour during what’s often unfairly dismissed as “The Beard Years”. Elvis was promoting the under-rated “Mighty Like a Rose” album. His band The Rude 5 featured such legendary session musician as Larry Knechtel (who played piano on Pet Sounds, Bridge Over Troubled Water and loads more), Jerry Scheff (the other Elvis’ live bassplayer in the 70s) and guitarist Marc Ribot and percussionist Michael Blair (both crucial elements of Tom Waits’ sound from the early 80s onwards). But most excitingly for me, behind the drum stool was Pete Thomas from the Attractions. This MTV Unplugged session was recorded around the same time so should give you an idea of what it was like, although Elvis let his freak flag fly and wore his long hair down when I saw him. Compared to the solo acoustic shows I’d seen in 1989, this gig was a bit disappointing. But it’s all relative isn’t it, so even a “disappointing” Costello gig is still great in my book! Posted by chorizogarbanzo on June 5, 2013 in Blog posts, Elvis Costello gig memories and tagged attractions, come back in a million years tour, elvis costello, Glastonbury Festival, jerry scheff, larry knechtel, London, marc ribot, Max Wall, mighty like a rose, nick lowe, pete thomas drummer, Royal Albert Hall, spike, Van Morrison.